my secret santa gift from Babe. I'd say the former, at least as an entry point. The kid labels are also placed a little lower (so grownups have to stoop to read them, dang it!). 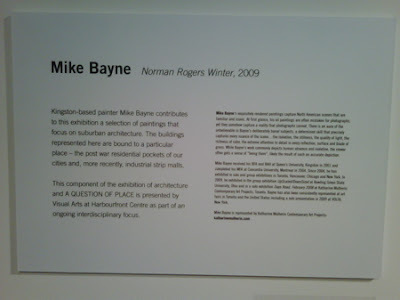 Incidentally, if you want to find out more about Mike Bayne's work, which is also worth a shout-out, go here. My efforts... though not 100%, are being published by Leah Sandals!! 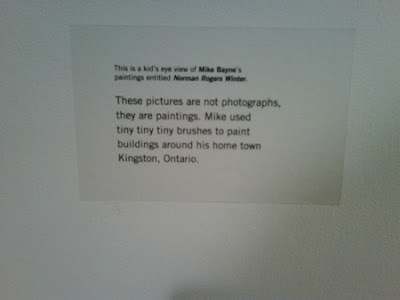 She comes to the gallery often and has written some amazing articles on art including our gallery as well. I hoped to run into her one of these days when she comes. but so far, I only to read her name off the guestbook. 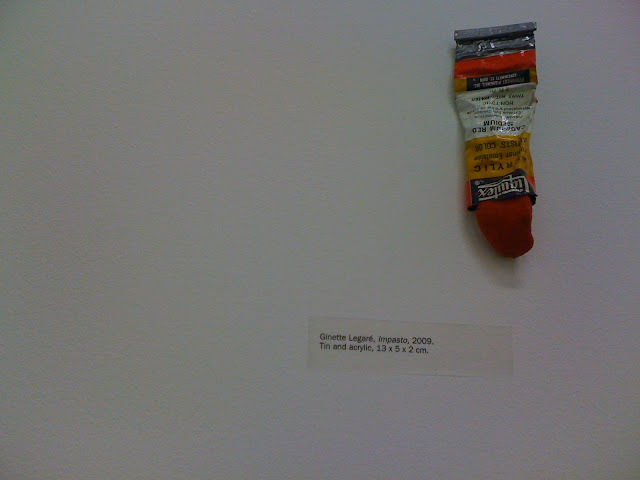 The Kid's Eye View, initiated in September 2008 for ARCADE exhibition, is still an ongoing project for me. I have learned that it is a lot harder to write from a kid's perspective than writing a term paper. To write about art without using some of the artistic terms I've used all of my academic life is painstaking. Breaking down and simplifying words are best worked with thesaurus; this feels very different though, it is usually the other way around, trying to look for a more 'intellectual' words, instead I need to go back to the simplest, elementary words. With great support and helps from the my supervisors, I am learning and learning and learning everyday. It is always satisfying to see the exhibitions or artworks get published in papers, magazines or blogs. To see something I have done published, is ten times more satisfying!!!! This is one of the many many many benefits of working at Harbourfront Centre. I hope this Kid's Eye View labels will prominently become an essential part of Visual Arts at Harbourfront Centre in near future, but there is still so much to study and learn from. it's just what I wished for! by the time this post is published, it will be secret santa time! I love scheduling ability of posts! This is awesome!! truly awesome... BRILLIANT! I think I am going to buy one for myself, unless my gift was unfortunate (or is it?) and did not get selected so I can keep it. lol. But who can say NO to such a creative invention? Ramen Fork was invented by Sugakiya, a Ramen restaurant in Nagoya Japan, aimed to eat the noodle and soup at the same time. This artistic shape was highly admired by The Museum of Modern Art in New York (MoMA) and was introduced to their museum gift shop. The museum says that it is making within the top 3 sales. It is 14 dollars for a piece. 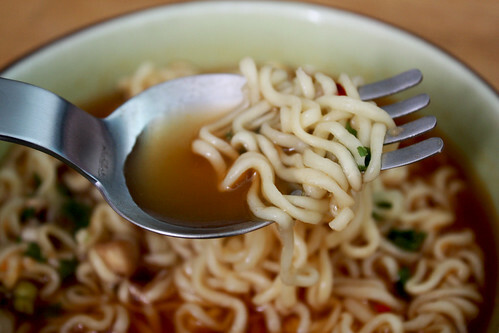 Sugakiya started introducing Ramen Fork since 1978. It was good for the environment as well as cost reduction, but many customers preferred the wooden chopsticks. For their 60-year anniversary, Sugakiya decided to completely renew it to a easy-to-use design. They asked Masami Takahashi for the new design and Sugakiya's CEO Shinichi Sugaki gave him only one request which was to create a sophisticated design that MoMA would exhibit it. It took an year for Mr. Takahashi to reach the final design. The difference from the previous design is the number of tynes and where they are placed. When Sugakiya hold a press conference for the newly designed Ramen Folk, by chance MoMA were in Japan and happened to see it on TV. This is how Mr. Sugaki's dream came true. 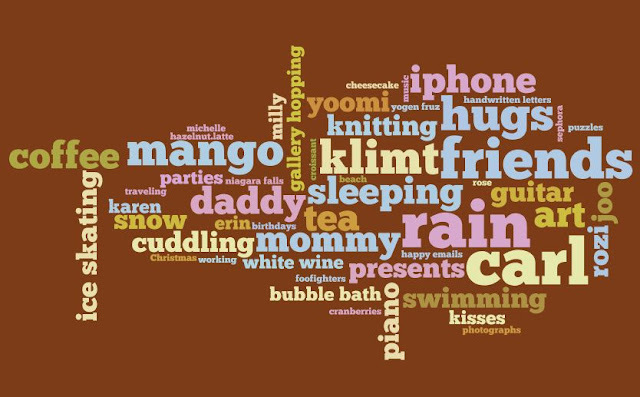 I played around with wordle today. it's a very creative tool for fun visual wording. 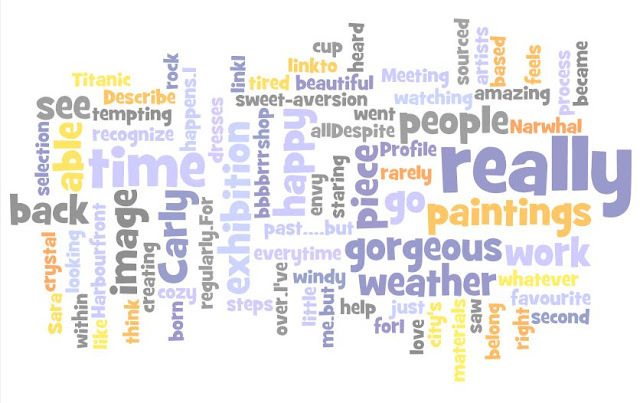 go a head and wordle crazy! second cup became my favourite coffee shop this winter. not only it is within 100 steps from work, it is housed in a really cozy building. I was able to recognize it right away when I saw it on their website. chocolate coated roasted corn at SOMA. omg, it's so so so scrumptious!!! but chocolate and cheesecake still remains as a treat for me. I only have it when I really really feel like having them, which is not very often. 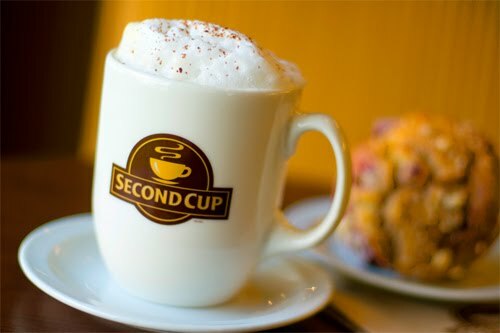 but this... hazelnut latte at Second Cup is just too comforting I cannot simply let go, yet. but when they make it with sugarfree syrup it tastes funky... so it's not truly skinny latte. comfort food is a definite need! I don't know what it is but I just can't help watching them over and over. well.. this is not really the case with me. but still, I love looking at all the gorgeous dresses that I will never be able to wear regularly. I wasn't into the story much and the screenplay wasn't as good as the novel. 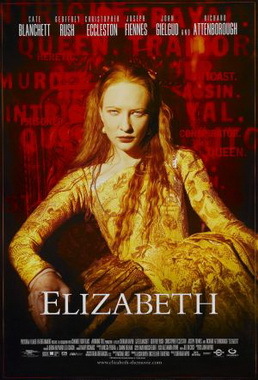 Elizabeth: The Golden Age, 2007. I loved both of the movies, Blanchett is awesome. I was so happy to hear that the sequel came out almost ten years later. 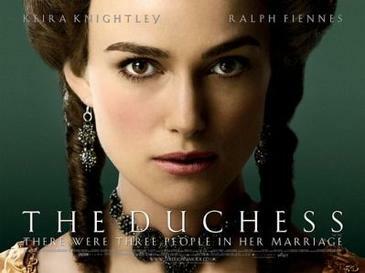 This is probably my fave Elizabeth movie. The Other Boleyn Girl, 2008. I was kind of disappointed with this one. I probably expected a lot lot lot more. Loved the cast, both ladies are so gorgeous. kind of makes me wonder.... no matter what and where, people are gonna cheat! lavish costume play. weird ending. it viewed more like a music video to me... watching pretty Kirsten in pretty dresses. yay! This was kind of like The Other Boleyn Girl. I really liked the sceneries more though. gorgeous landscapes!! Girl with a Pearl Earring, 2003. Oh so pretty Scralett. I love this painting and she really pulled it off! amazing!! Colin Firth as Vermeer was kind of surprising at first, didn't really seem the type. just like Ed Harris as Jackson Pollock and Robert Pattinson as Salvador Dalí (I have yet to see this one). really? Robert Pattinson? lol.. all I can think of his way-too-much pale cakey makeup from Twilight. This one and Elizabeth came out around same time and seemed Shakespeare in Love got most of the glory then. It was hooray for Joseph Fiennes though, he was in both movies. since he didn't even go to school to learn to write, thus it is not high literature as is prised today. The Tudors, 2007-current. TV series. I haven't seen this one yet and I am dying to. maybe I'll just rent the DVD later, become a hermit and watch the entire series. I went to see the 'little crowns' exhibition at Narwhal yesterday. 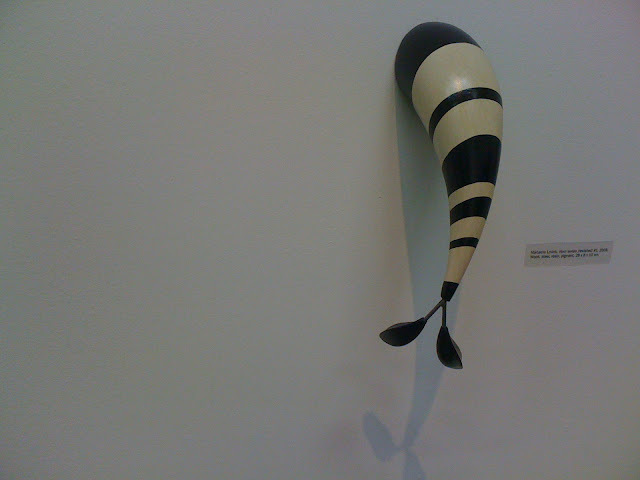 Each piece in the exhibition were precious, I really loved all the works. 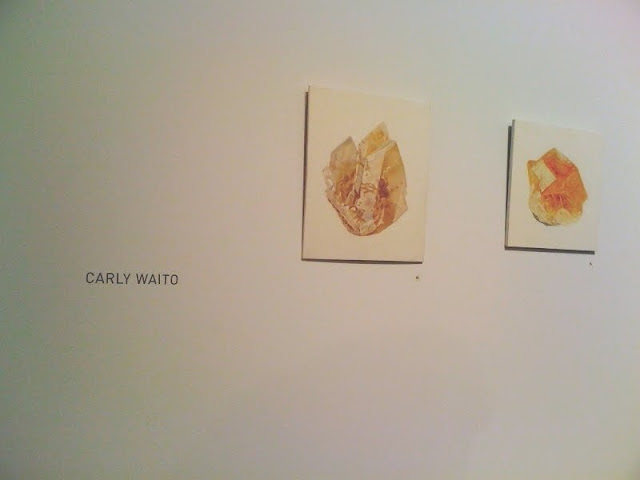 I was so happy to see Carly's beautiful paintings again. yay! I don't think I will ever get tired of staring at these gorgeous jewels. I was happy to see one of them was already sold when I went there.. 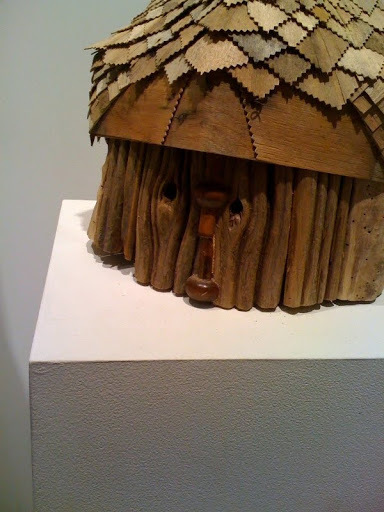 The masks by Noel Middleton seemed like a mystical creature that just popped out of a children's fantasy picture book. This is one of the few things forces me to enjoy? Toronto winter. now I can't wait till my Christmas party...! yay! Describe your process of creating a piece? What materials do you work with? The first few crystal paintings I did were based on reference photos I sourced online. Now that I have a DSLR and a good macro lens, I take my own photos of specimens I collect myself. I use these images as reference for the paintings which are done with water-mixable oil paints on masonite. The water-mixable oils are great for me since I work from home. Can you talk a little about the upcoming holiday show 'Little Crowns' at Narwhal Art Projects? What are your inspirations for the pieces in the show? 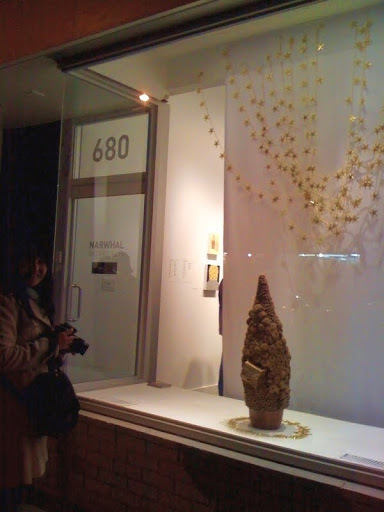 It is a group exhibition [http://www.narwhalartprojects.com/exhibitions/2009/littlecrowns] focusing on the magical aspects of this season and idea of applying mystical qualities to earthly objects. I'm so excited to be included with artists I love, like Naomi Yasui [http://canadianchina.blogspot.com] and Selena Wong [http://www.selenawong.com]. I'm fascinated with the natural world – especially the little parts we feel compelled to pick up and keep. I've always been a collector, and I'm really interested in exploring this common impulse to possess pieces of nature which we find beautiful or curious. These paintings are an extension of this impulse. I'm interested in how we assign complex layers of value to these objects based different factors, like rarity, historical context, scientific significance, subjective notions of beauty, and, for some people, even metaphysical or healing properties. I am not an early riser. My routine lately is to start around noon and work until my eyes get tired. If I can stay focused, I like to put in a solid 10 hours. I have a hard time painting in the evenings after work (at my part-time gallery job), because my eyes are too strained after a day on the computer. I guess with detailed work like this, it's all about the eyes. And, I'm definitely most productive when I have a deadline to motivate me. Other than mineral specimens... well, I always have a bunch of things exciting me at any given point, which tend to distract me from whatever responsibility I should be focusing on. Right now I'm knitting like crazy, and I'm especially excited about traditional Norwegian mittens. Since we moved into this apartment a year ago, which has a great backyard, I've been getting pretty serious about gardening - but that obsession is pretty much on hold until I turn the dining room into a seedling grow-op in the late winter. 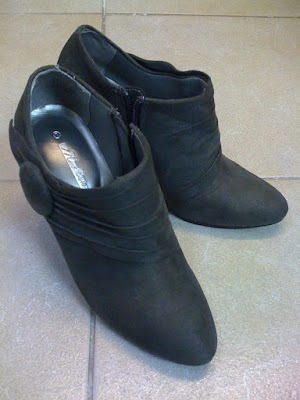 I'm also getting into taking pictures, some of which get posted on my blog [http://carlywaito.blogspot.com]. Basically my blog is a way to focus and express all these interests. Looking at your blog regularly, I see you are fond of vintage illustrations from old text books. Is this something you collect? or do you use it for inspiration in your own work? 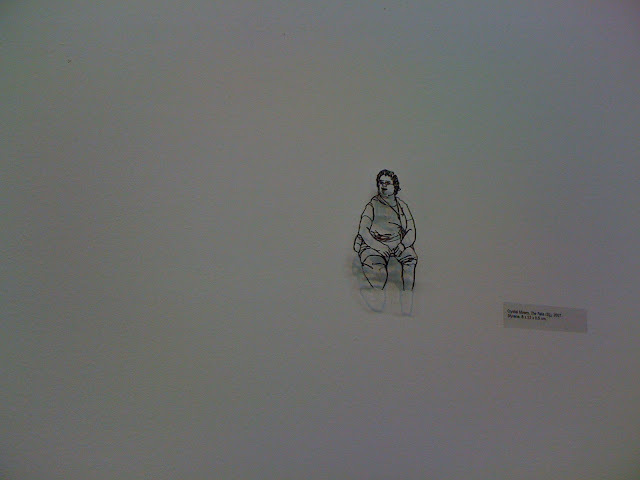 Mostly I collect images in digital form (i.e. saving images from ebay listings). I don't often actually buy them, although I would if I could afford to. I have been buying some vintage science books lately - they are often inexpensive compared to the antique prints I peruse on ebay. I'm hoping to find some more at my favorite charity shop in Thunder Bay when I visit my family for Christmas. I'm bringing an extra suitcase in anticipation! On my last visit I picked up a great book about crystals with fantastic off-coloured old photos, and a book from the series The Ocean World of Jacques Cousteau which has the most charming illustrations. These images aren't used directly in my work, but they do feed my creative impulses somewhat. I love being at home, curled up with my knitting and a glass of red wine in the winter or working out in the garden in the summer. I also love to walk around my neighbourhood, (near High Park) with my camera, or biking up to the Junction on the weekend for breakfast at Espresso Mi Vida. Food is the main thing that occasionally draws me out into the world. Now that it's getting cold, all I can think about is dumpling soon tofu from Buk Chang Dong Soon Tofu in Korea Town - my ultimate comfort food. What are some projects you are currently working on? For the last five years since finishing design school my main focus has been the ceramic design studio (coe&waito [http://coeandwaito.com]) I shared with Alissa Coe. We let go of our studio and the production part of our company recently, which has freed up some time and creative energy for other stuff. This is the first time I've really focused on painting and I am so excited to see how it will develop. I'll be doing more of these mineral paintings. I've also been doing a lot of reading and visual research, thinking about the possibility of a larger body of work which incorporates the mineral paintings but maybe stretches into other media/ideas. I'm so happy for you Carly!! I can't wait to go see her paintings today at Narwhal Art Projects, "little crowns"
The 2010 Vancouver Winter Olympics torch relay is happening in Toronto on Dec 17-19!!!! The Olympic Flame will be in Toronto from December 17 to 19. During the three days, approximately 1,000 Torchbearers will carry the Torch for 48 kilometres through city streets. The Torch will enter into Toronto at Yonge Street and Steeles Avenue at 1:52 p.m. on December 17. Torchbearers will run through Toronto neighbourhoods from 2 to 7 p.m. on the afternoon of Dec 17, from 6 am to 8:45 a.m. on Dec 18 and on December 19 from 10:19 a.m. to 10:37 a.m.
Maybe I'll stop by at Nathan Phillps Square to see all the FIRE!!!!!! Annual Member's Show & Sale! Mercer Union again delivers its big gift to small collectors in this year's SOLID GOLD rendition of the annual member's show & sale. Nothing but SOLID GOLD quality works, all priced at $149.99. Watch the gold rush when the sale begins. Bar opens 6 PM. Sale begins 8 PM. The earlier you join the line, the better your chances of getting the exact nugget you've been waiting to sink your teeth into! Artists: bring us your art and we'll split the dividends from the sale of the work. Feeling generous and love what we do? Give us 100% of the proceeds from the sale and we'll a) love you for ever and b) give you a tax donation for the amount. Partial donations are also accepted. To participate, fill out the PDF form, indicating your current membership status or sign up for a new one! Work must be dropped off no later than Tuesday 15 December.